One Christmas Eve Tom opens the back door of his farmhouse and can hardly believe his eyes when he spots a lion with a string of sausages in his mouth! Unfortunately no one he tells seems to believe him. Not his parents, aunt and uncle, school friends or teacher, no one that is until he meets Clare who has seen the lion too. How can they prove to everyone they are telling the truth and Tom’s ‘sausage lion’ is real? Using a camera and steady supplies of meat as bait they hatch a plan. This is an exciting adventure story with a satisfying ending about belief, courage and fear. What do we find out about how different characters are thinking and feeling about Tom and the lion at the beginning and end of the story? How might Tom have felt when nobody believed him? What was the most interesting, or most surprising thing that happened in this story? Which bits of the story (scenes) could you see in your mind most clearly? Children could make a set of drawings as if they are snapshots of key points in the story: Tom’s sightings of the lion and when he and Clare take the lion to school and into town. Stick them in a scrapbook or on two sheets of folded paper and add captions for each picture. With your child pretending to be a reporter interviewing different people in the story about what happened, you could role play conversations together. A tube as microphone would make this more fun. Using the links below your child can find out more about cougars/mountain lions and make a fact file sheet. 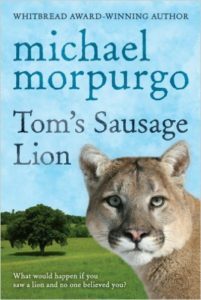 Find out more about the author, Michael Morpurgo here. A former children’s laureate, Michael Morpurgo has written a considerable number of children’s books, many for older children including the highly acclaimed War Horse which has become a stage production and feature film.